John Goss (1891-1953) was one of the most important British musicians and colourful personalities of the inter-war era. Singer, scholar and a lover of life, he was adulated by the composer's whose music he championed, including Warlock, Delius and Moeran. 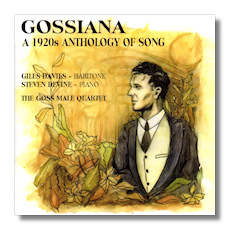 Goss was also responsible for the revival of the British Ballad in the 1920's and together with Warlock, was the driving force in resurrecting the English Jacobean and Elizabethan Lute Song Repertoire. He was a great entertainer and an innate musician and performer. This CD is a celebration and dedication to this wonderfully talented character and the items chosen are perhaps many that Goss himself might have included in his recitals. The 28 tracks include Early English Ballads, Elizabethan Songs, Lieder by Mozart and Schubert, English Songs (mainly by Warlock) and Traditional Ballads and Sea Songs. For Giles Davis, this is obviously a labour of love and he manages to squeeze out all the emotional and musical expressiveness of the repertoire in question. Stephen Devine and the Goss Male Quartet lend sympathetic support throughout. This is certainly a fitting tribute to one of Britain's most lovable yet astoundingly neglected artists.